In the Ohinata, Sakuho-town, Nagano-pref. of Japan, this tiny off-grid cottage has a view of Mt. Morai and is a one-room structure ideal for unwinding and taking it easy for a few days. Curl up by the wood stove or grab a book and head outside out to the hammock, complete with picturesque mountain views. Their vision is to embody the simple and enjoyable experience of living in the country. They have 8 custom cabins overlooking the Petchaburi River and, as they put it, life is complicated enough so these cabins are simple. They encourage you to book all 8 cabins with friends or family, so why not use that as inspiration to plan a trip to Thailand with your best pals! 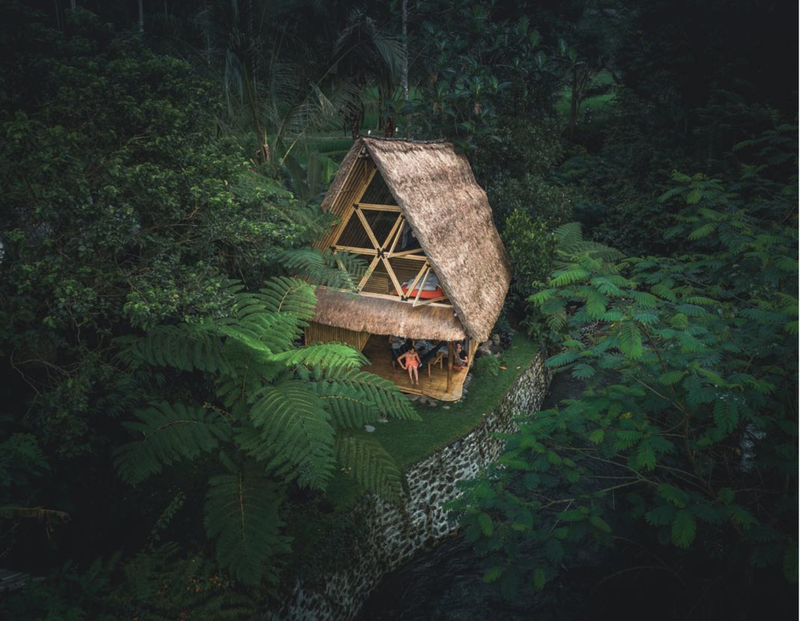 Unique eco-bamboo home in Bali, in the mountains of the Gunung Agung Volcano. They have the Hideout as well as the Lightroom if this spot is booked. The cabin is faraway from neighbors, it has house kittens, and a fully stocked kitchen and scooter. It's also designed so that you experience nature, located near a river and rice fields, so you'll see a lot of animals and hear plenty of them, too. This two story structure is amazing, eco-friendly, and absolutely a stunner. A romantic little spot placed among the rice fields, surrounded by jungle. It's paradise. From the edible flowers that surround you to the 12 acres of lush land just about everywhere you can see, it's no wonder this reclaimed joglo (a traditional Javanese house) is simple, spacious, and just right. The owners offer every amenity you could need -- down to bike rentals, a driver, and private Balinese cooking classes -- so take advantage, unwind, and get mellow. This modern, airy villa in the heart of one of Bali's most desired areas is a dream getaway. You'll find 3 bedrooms and 2.5 bathrooms so it's a great spot for a vacation with family or friends. With its Mediterranean inspired interiors and views of the neighboring rice fields, you'll never want to leave this lil slice of paradise. Located on the banks of the Yoshino River in Nara, not far outside of Osaka, the Cedar House offers beautiful Japanese architecture with unique concepts and themes for their rooms. As they say, "A building without people is just a structure...spaces should act as vessels which bring people together." Designed by Go Hasegawa, the building is mostly built of cedar while also featuring 28 types of local wood. Based on the ancient Japanese concept of engawa, the building features a ledge that extends beyond, inviting the community in. In addition, they have an easterly facing room for rent (the Sunrise Room) and a westerly facing room (the Sunset Room). They can host up to seven overnight guests. The best part of the Cedar House is that it was designed as a project to explore how sharing, architecture, and culture can revitalize rural communities.